Now that you have felt the touch of Turquoise Summers, he has returned with the EP titled SHADES. From the first kick drum this Southern California native straps the listener in for a ride thru the streets of the mans soul. High on the breeze of success to hitting the pavement and bouncing back from a bad break-up and loss of a loved one. Turquoise Summers has poured vivid sonic emotion into an instrumental dialog that is so intimate, when you hear his voice over the sounds of his vintage synths and drum arrangements, you start wondering how it's possible to be listening in 3D. 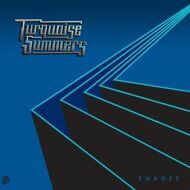 SHADES undeniably walks in and out of the shadows of life with intricate chords and arrangements that express love, completion and growth in only a way TURQUOISE SUMMERS can. 100% Raw and uncut MODERN FUNK!